6am and a dull, grey Sunday morning coming down, as Paul guides the white IT machine gently along the Irish Ferries gang-plank and back onto the home soil of Dublin Port. Tired but excited and chatty IT’s, documenting our most recent boat trip and eagerly contemplating the next, as they prepared to depart for all points north, south and west. Hands clasped, backs clapped, arms waved, laughs shared, was it really 24 hours since the daytrippers set out on another Blue tinged excursion? 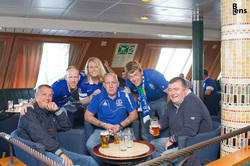 Yes, it was hard to believe that another successful IT bus/boat trip to Goodison and back, had already come and gone. Another IT journey full of fun, laughter, excitement, comraderie, friendship and happy memories had passed into history. It seemed just a short few minutes ago, when Peter Pieman and the Pie-girlettes, Aine and Lianna, were welcoming us on board and ensuring we were well settled and prepared for the journey ahead. Paul, our world champion driver looking very fit and enquiring about “the piles” in his usual jovial manner. The wholehearted greetings from all our fellow IT’s, making us feel totally at home and at ease. They came from all over, The east, south east, midlands, the west, the north, the ends of the earth, the Peters, Joe‘s, Jimmy‘s, Jimmy‘s, Jimmy‘s, Jim‘s, John Joe‘s, Stephen‘s, Shane‘s Alan‘s, Davy‘s, Gareth‘s, Paul,s, Donna‘s, Mark‘s, Mick‘s, Tom‘s, Gary’s, Neil’s, Whamo’s, Bernard’s etc’s etc’s, each and everyone delighted that we were here, we were ready. We were concerned that our team was missing some of our older, wiser and most experienced stars for our latest expedition to Merseyside. How would we fare without Big Dunk to lead and guide us, Tom to lead and guide Dunk, playmakers Dom and Kev to inspire, Frank for his knowledge of all things Everton, the realtq to ensure our literary decorum. These absentee’s seemed almost fatal to us intrepid travellers, and created a certain amount of nervous tension. However, Peter Pieman assured all and sundry that he had a bus full of young, talented, energetic, passionate and committed members, who could hold their own in any auditorium or battlefield. We still had many of our shining lights and he convinced us that he had put together a splendid mix of wild, exuberant youth and steady old hands. Frisked first by security for any illegal contraband, we took our seats and waved a temporary goodbye to d’aul sod. 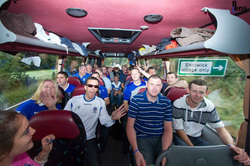 A new era was beginning, not only in Goodison, but also, on the IT bus. Exit the bus on deck 5, up the Ruby Stairs and stake our usual spot on the top starboard side. Peter and his Pie-girlettes distributed our match tickets and, most important our Hughie Breakfast vouchers. In the knowledge there would be no famous sambo’s from K&D’s Deli on this trip, we rushed to fortify ourselves with the full Irish. 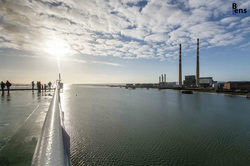 Before we knew it, we were soon sailing smoothly across the Irish Sea. Peter then gathered us all together and with bowed head, solemly informed us, that our top scorer, JimmyM, phoned him before dawn and informed him that he couldn’t make the trip. He was up all night with d’aul bug and was feeling miserable. Well now, how was our team going to cope with another major defection, especially at such short notice and with no possible replacements? The breakfast shifted uneasily as our stomachs sank. Peter however, stood proudly on the deck, head up, arms out, chest out, legs apart and confidently told us, that this setback would only strengthen our resolve further, and pounding the table, he roared lion-like, that with an extra Herculean effort from every man, woman and child, we’d perform heroically and powerfully in the face of seeming adversity. Re-enervated and re-motivated we took our places again, shared some drinks and contemplated the day and season ahead. “Great to be there for Martinez first game”, “How would we play”, “Will transfer talk affect Baines and Fellaini”, “Will rumours affect the team’s performance”, “Why are Moyes and ManU treating us so badly?”, “Will Barkley start again?”. All these important questions and more tossed around and digested by the travelling party. In no time at all, we were landed in sunny Holyhead. Back down the Ruby stairs, onto deck 5 and load into the bus with no problem whatsoever. Paul guides us safely onto Welsh soil, and imagine our surprise and delight, as in the midst of excited screaming and hand clapping, a smiling JimmyM appears in through the door of the bus before we left Holyhead Port. Eyes were rubbed, eyes were closed, opened, rubbed again….as the IT’s tried to stare in disbelief, mouths open, jaws hitting the floor. Was this a mirage, a nasty trick being played by koppites somewhere, or had some modern miracle rising truly occurred? True enough, when the dust settled, it was indeed JimmyM. He somehow transported himself out of his sick bed and reached Holyhead before us. All sorts of rumours abounded as to how he made it. Some said he swam with no armbands, some said he actually came over last night, others said he flew, others said he jumped to head a ball in Naas and landed in Holyhead!! Jimmy’s account, that he felt so bad missing the trip, he raised himself from his sick bed, and overdosing on empodium, made the Club Deck of the Seacat that left sometime after us and arrived before us. What commitment, what passion, what desire to take part and win. Well this time, there was no need for motivating speeches from Peter, as we sped out of Holyhead and onto the A55 with our new hero, JimmyM. With newly acquired confidence then, we rolled steadily towards Liverpool. JO’R produced his latest, anxiously awaited “thankgodfrankisnotheresoihaveachanceofwinningquiz” quiz. Peter and his Pie-girlettes handed out the rubber topped lead pencils and answer sheets as the battle commenced to determine the new champion or champions. We all thought we had a great chance, but we didn’t reckon with the two treacherous scouser’s, Gary and Whamo, who proceeded to wipe the floor with everyone and left us trailing sadly in their wake. Of course everyone clapped and cheered while they received the first prize of Lone Ranger and Tonto masks that fitted perfectly. Whamo complained that there should have been a crow included with his mask, to wear on his head, just like the real thing. Aine and Cliona were also big winners in this competition. Bernard was running swiftly around the bus taking pictures with his high-powered, pump action camera, as the Pie-girlettes issued details of the golden goal and attendance competitions. We rolled past some of our favourite pit stops and fondly reminisced about our past trips, when we visited some of the Welsh coastal beauty spots, taking in the white, foam capped waves as they splashed gently upon the white sandy beaches, with the white gulls swirling and swooping in the air, the white tipped off-shore windmills circling and shining in the reflected sun, and the fishermen quietly hunting for their white bellied catches as the IT’s gracefully off-loaded from their white transport machine, and lined up to leave their environmental footprint on the Welsh soil and breathe in the clean, clear sea air. AH, those were the days. Rumours soon emanated around the bus, that illegal contraband was on board and hidden in the darkest corners and regions of the vehicle. Sure enough the call rang out for “Pit-Stop!!!”. Paul located a suitable location, disengaged his mechanism, locked his gears, and we all clambered out to view the surroundings and stretch the legs. Donna was relieved, as sales of her world famous handbags were down on previous trips and she could now finally report a brisk trade. The miracle of supply and demand will always amaze me. Of course, security was perturbed by the turn of events, and a search of the bus was ordered. Seats were ripped up, bags were opened, dashboards were taken apart, petrol tanks emptied, but nothing turned up and no-one admitted to any smuggling or wrongdoing. There were a few knowing winks though, and chief suspects were quickly identified and placed under strict observation. Without further ado however, we were all allowed back on the bus and proceeded steadily towards our Holy Grail. The IT Touring Bus was soon recognised by fellow travellers and became the recipient of excited, knowing glances as horns were beeped and arms were waved in jubilation, as we rolled gently past and slowly receded from their view. Both lanes of the dual carriageway were full, as the news of our arrival spread far and wide and travellers queued up to get a look at their favourite Toffee’s supporters club on the move. Through the toll bridge, under the Mersey and soon we were in Everton, rolling along Walton towards Goodison Road, up Priory Road, the crowds lining the streets chanting and cheering as we sped past. A quick disembarkation on Arkle’s Lane, our usual respects to klanfield and we were across Stanley Park like the discharge from a shotgun. Time to fetch a few programmes as we spread out between the Park End and The Gwlady’s. We had decided to operate from both ends of the ground, to put as much pressure as possible on the Baggie’s. 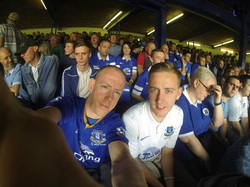 In time to take our seats, we paid homage to the late, great Dave Hickson, cheered the star of the new Barclay’s Premier League advert, Billy Ingham, the proud holder of 69 years of Everton season tickets. Trappatoni was there to cast an eye on Gibson, Coleman and Long. A glance over towards Roberto Martinez, the crowd cheering and the game was finally on. The 2013/’14 season was started at last. From the start, it was clear WBA came for a 0-0 draw. They crowded their own half of the pitch and made only a few attempts to move forward. Shane Long was making a nuisance of himself, but Everton assumed control early on, had most of the possession and created a few chances for Pienaar. Foster in the WBA goal made a couple of good saves and very soon the game settled into a pattern of our defence passing slowly to the south, pass west, pass east, pass back, pass forward…a lot of tipping, tapping with the odd short, sharp burst forward, but with no penetration and no real bite, urgency or passion. We didn’t have the guile to break them down. Barkley and Coleman both looked up for it though and made some stylish and telling contributions. The anticipation and excitement that rang around Goodison whenever they were on the ball was incredible. Fellaini was trying hard, but the ref was making life difficult for him and his timing and passing were well off. Baines was not up to his usual high standard, Pienaar was in and out of the game, Osman wasn’t bad, but wasn’t good either, Mirallas and Jelavic were trying hard, but weren’t making any impression. Jags, Distin and Howard were coping well with the few things thrown at them. The game went very flat as half-time approached and the talk was of an improved performance in the second. However, the picture didn’t change much in the second. Coleman and Barkley still provided any thrills there were. Fellaini went close twice, Coleman went close on a number of occasions and did his best to create openings for others. Naismith came on for a disappointing Mirallas and Kone came on for Jelavic. Naismith made no improvement, but Kone looked good whenever he was involved. WBA only made a few forays into our half, Jags made a couple of desperate clearances but had an otherwise good game. The game petered out at 0-0 and we were all slightly deflated, except for Alan who screamed and hollered, waved his fists in the air, pounded the ground with his feet, as the whole stadium turned towards the Gwlady‘s to see what all the fuss and commotion was about. We had to explain that he won the golden goal competition. The stadium quietly congratulated him as it slowly emptied. We’d like to have seen Oviedo and Deulefeu in action. Gibson was injured so couldn’t play. It would have been interesting to see Kone and Jelavic or Kone and Anichebe together also, but it wasn’t to be. The general consensus was that Baines and Fellaini were affected by the transfer talk and that this affected the whole team. The sooner the transfer window is closed the better. Anyway, we headed out into the evening sun, visited the souvenir stands and paid a visit to the Everton One Store. We were surprised at how fast the WBA players were out to their bus and we went to greet our Everton heroes at the Park End on their way out. It was good to see the fans waiting to meet the players and get their autographs. Coleman, Barkley, Fellaini, Jelavic, Anichebe, Mirallas, Stones, Duffy, Heitinga were all happy to meet and chat with the fans. Pienaar appeared, pushing the pram of his new family member with his missus. He looked nervous, apprehensive and hesitant…just like his game really, so we put his performance down to that. We were disappointed with new loan signing Deulefeu, who walked past and didn’t recognise the fans at all. We put it down to a shy, young, home-sick guy, living in a strange city and culture, but we hope he learns to build a relationship with the fans soon, or he will find it difficult to become a Goodison hero, unless he plays remarkably well. Meet up with the bus then at 6.30pm and return to the city. We headed for various bars, hostelries and restaurants. Liverpool was lively, loud and buzzing, as there was a Beatles International Weekend happening, on top of the normal nightlife. We all gathered at our usual post-match haunt,Rigsby's, for a good chat about the game and finally left Liverpool at 10.45pm. A number of our younger team were completely enthralled and mesmerised by the wares Liverpool had to offer and were allowed to stay over, but only after they signed the security form absolving the IT’s of all responsibility for anything and everything. Back onto the A55,heading towards Holyhead and the second miracle of the day happened. Davy, or was it Paul, chanted “McDonalds, McDonalds”….and before you could blink, there we were, standing in the middle of McDonald’s, in the middle of nowhere, ordering our Big Macs, Baps, coffee’s, teas. JimmyM even handed around the chicken nuggets. No sooner were we back on the bus than Peter Pieman decided to get the show on the road, with his infamous happy country song “Yadel ae hee, yadel ae hee, yadel ae hee hoo”, about the granny falling over the cliff in her wheelchair. I tell you, there wasn’t a dry eye in the house. Gary then leaped up to forecast the rest of our day with a raucous, rockin’ version of the Small Faces “Lazy Sunday Afternoon”. There followed a battle of the bands as….mic, Peter….mic Gary…….mic Peter…..mic Gary kept the crowd clapping and singing…and Paul drove on. Gary finished his Everton selection and before he could say “Paul Weller Tribute”, JO’R decided to launch his new album 6 in the “Where the fcuk are we” series, with a surprise version of his tale about his “Summer In Dublin”. I can tell you, it was HOT, and will be as big a seller as his previous record breaking releases. The surprise package of the night was one of our new young guns, Marty Harte, who took to the mic like a seasoned professional and regaled us with songs about big strong men and other stories. Some said he was a brother of Mickey Joe Harte, others said he was Luke Kelly’s great-great-great grandson, some others swore, "no, he was Shane McGowan’s long lost son"….either way he rocked the bus…..and Paul drove on. A lot of singing, chatting, sleeping later and we arrived at the boat at 1.45am well in time for the 2.40am sailing. Up the stairs and we claimed our usual spot on the starboard side. Some reddite outlaws tried to usurp our position and steal our Marouane Fellaini Song for Mignolet, but our security team, with the aid of the local sheriff and deputy, corralled them into a corner and silenced them. There’s no truth in the rumour that the earthquakes in the Irish Sea this morning were caused by them being thrown off the boat. Time then for more chatting, a few drinks, a bit to eat and some much needed shut eye. Some of the more energetic took up a card game and proceeded to be cleaned out by Peter Pieman. Word of warning, don’t play cards with Peter Pieman, unless you are a shark. The lights of Dublin soon came into view and we took our places on the bus once again. We all spoke of another great trip and planned the next one to the derby in November. Some are heading over for the Hull game. We spoke of how we’d sleep when we’d get home. Some had to go shopping, others to go to Croker for Mayo v Tyrone…others to a Cannonball Run, but most of all we spoke about this trip and planned future ones. We all headed home in our different directions in various modes of transport. Some just got on the road and stuck out their thumbs, for they knew you’d be there still. Roll on next boat trip. Many thanks to JQ for another report! Gallery of this trip can be found here.